Description: York Courantp.1,col.1Wednesday’s and Thursday’s Posts.From the LONDON GAZETTE.Admiralty-Office, January 11, 1780Capt. 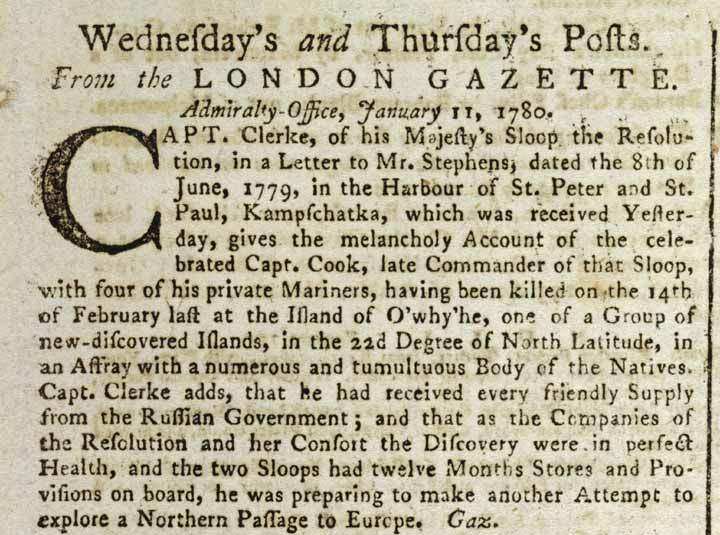 Clerke, of his Majesty’s Sloop the Resolution, in a Letter to Mr. Stephens, dated the 8th of June, 1779, in the Harbour of St. Peter and St. Paul, Kampfchatka, which was received yesterday, gives the melancholy Account of the celebrated Capt. Cook, late commander of that Sloop, with four of his private mariners, having been killed on the 14th of February last at the Island of O’why’he, one of a Group of new-discovered Islands, in the 22d Degree of North Latitude, in an Affray with a numerous and tumultuous Body of the Natives. Capt. Clerke adds, that he had received every friendly supply from the Russian Government; and that as the Companies of the Resolution and her Consort the discovery were in perfect health, and the two Sloops had twelve Months Stores and Provisions on board, he was preparing to make another Attempt to explore a Northern Passage to Europe.